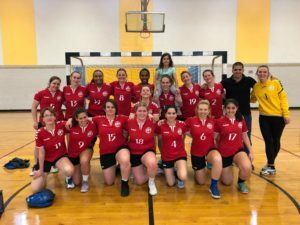 An opportunity to play a handball game, friendly or competitive, is always accepted by Boston Team Handball’s women’s team. Sunday, March 25th the women’s team caravaned their way to West Point Military Academy for the third time this season for the Laura Walker Memorial Tournament, a yearly event in honor of a fallen West Point alumna and handball player at the military academy. 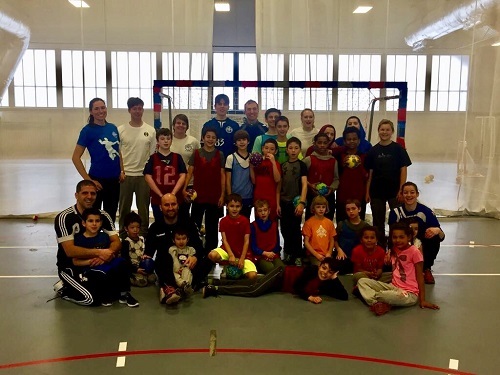 While this year had a limited number of teams in attendance, West Point Black and Gold generously opted to host Penn State and Boston for a single day of friendly competition. BTH, the team with the highest national and league ranking at the event, chose to use this game day to work on plays and tactics in anticipation of Nationals in May, as well as giving some of the clubs newest players their time to shine and get solid minutes on the court. The team came together nicely not only on the court, but also on the bench as players cheered and showed support for their teammates. After trying out new tactics and working on their plays, BTH went for the clean sweep with wins against Penn State (15-2), West Point Black (19-13), and West Point Gold (21-5). While BTH is coming off a high note from the weekend, work remains to be done as the club trains to be a force to be reconned with and hopes to compete for a medal at this year’s Nationals in Myrtle Beach, SC. ← Women tournament in Boston – A demonstration of team spirit!